I have to confess that the name of composer Ian Venables was new to me, though he has an extensive catalogue and recordings. This new disc, from baritone Roderick Williams, the Carducci String Quartet and pianist Graham J Lloyd on the Signum Classics label showcases two song cycles by Ian Venables, along with a selection of solo songs. Venables lives in Worcestershire and seems to be highly influenced both by the landscape and the composers who lived in the area such as Ivor Gurney (whose poems Venables has set) in that his music is robustly not following current idioms. The first work on the disc The Song of the Severn for baritone, string quartet and piano was premiered in 2013 at Malvern Theatre and was commissioned by Malvern Concert Club. The work takes six poems, by John Masefield, AE Housman, John Drinkwater and Philip Warner which look at aspects of the river and its spiritual resonances. 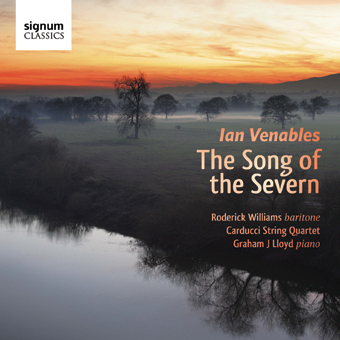 The first song, On Malvern Hill (John Masefield) introduces us to Venables' style which lyric and tonal, in a pastoral vein which recalls other English composers such as Gurney and Finzi. Masefield's poem makes for quite a wordy song and it is clear that it is the poetry which inspires Venables, and all the songs on the disc showcase the text to a great extent. The song is rather elegiac but with a constant sense of forward flow. How Clear, How Lovely Bright (AE Housman) is similar in its elegiac sense and the dominance of the text, though there are big romantic moments. Though Venables writes tonally, he does not necessarily write big tunes and his songs can repay attention. John Drinkwater's Elgar's Music is gently evocative with some lovely textures. Laugh and Be Merry (John Masefield) is lively and robust, whilst the final song The River in December (Philip Warner) is quietly elegiac with a strong sense of the poetry and lovely sense of atmosphere at the end. Throughout the cycle Venables uses his forces to create some highly atmospheric textures. The Pine Boughs Past Music was commissioned for the Gloucester Music Society's 80th anniversary celebrations in 2010. Here, Venables sets four poems by Ivor Gurney and one, In Memorian: Ivor Gurney, by Leonard Clark. This cycle is for just baritone and piano. My heart makes songs on lonely roads is quietly lyric and melancholy, whilst Soft Rain uses a delicate piano to evoke rain in complement to the gentle but intense vocal part which develops in strength through the song. The Wind has a similar combination of gently evocative piano and quietly intense vocals, a mood which is continued into the final song In Memoriam: Ivor Gurney which is mesmerising in the way it holds the mood and gradually builds to a climax. Next come four songs with string quartet (no piano). Flying Crooked sets Robert Graves and combines humour with a perky, characterful accompaniment. A Kiss, setting Thomas Hardy, is lyric and thoughtful with long breathed lines, beautifully constructed. John Clare's Evening Bells is lighter in feel with a perky accompaniment and hints of RVW. The Night Has A Thousand Eyes (by rancis William Bourdillon) is thoughtful with a rocking figure in the quartet and a lovely floated high line from Roderick Williams. Finally there is a group of songs with piano, again these are individual songs rather than a set. Break, break,break (Tennyson) has cascades of notes in the transparent piano part with lively and robust vocal line. Midnight Lamentation (Harold Monro) and The Hippo (Theodore Roethke) are gently and thoughtful, with beautifully crafted in the way the songs follow the words. The Invitation to the Gondola (John Addington Symonds) is very English in style, a lilting ballad melody which again hints at RVW. Finally Frutta di Mare (Geoffrey Scott) has a lovely transparent piano part with a considered, thoughtful vocal line. Listening to all these songs, I started to recognise some familiarities in the Ian Venables constructs his songs, often combining a gently undulating vocal line with a repeated, building figure in the accompaniment. He clearly pays attention to the poems and the words (adjective wordy cropped up a lot in my notes), and many of the poems have substantial metrical structures rather than being simple lyrics. All this requires a performer who is similarly attuned. This he gets from Roderick Williams whose performances are exemplary, singing with a wonderfully even and easy sense of line and diction such that you never need to resort to the booklet. The Carducci String Quartet and Graham J Lloyd provide finely sympathetic accompaniments and clearly relish Venables interesting way with the textures involved in the various combinations. All that said, I have to confess that I found a little went a long way. A song recital which included one of Venables cycles would be a notable event but by the end of the disc I was starting to feel something of a surfeit and longed for a bit more grit or extreme emotionalism. Perhaps it was the decision to theme the recital on the Severn and we would have benefited with some of Venables other songs. But if you are interested in where the English Art Song has gone recently, then this is a disc for you to explore.